Grand Hyatt Kauai Resort & Spa, Hawaii 5.0 out of 5 based on ratings. 1 user reviews. 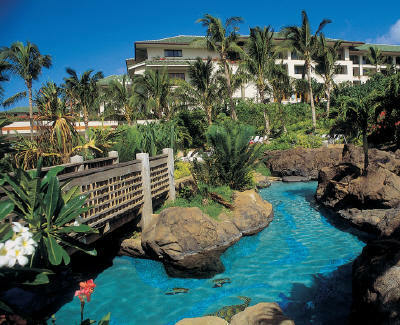 Grand Hyatt Kauai is super luxurious and set on Shipwreck Beach, as 50 lavishly planted acres . The 602-room resort is completely self-contained. At night, guests are found listening to jazz while savoring cigars, swaying to Hawaiian music, dining under thatched-roof huts surrounded by water, or cuddling on secluded wood swings in the moonlight. Amenity highlights: Some guests head for spiritual and physical rejuvenation at Anara Spa, a $3.5 million facility with 11 treatment rooms, full-service beauty salon, relaxation lounge, sauna and steam rooms, and luxury spa suite for couples or friends who want to enjoy treatments together. Massages, manicures, and pedicures also are offered in oceanfront cabanas. Extensive fitness programs include yoga, water aerobics, meditation, Tai Chi, Pilates, and flexibility training.